James Butler responds to a Mark Fisher article on 'neo-anarchism'. 1. I don’t think it’s possible to quarrel with Fisher’s broad presentation of where we stand: I outlined a similar view of the current state of things ahead of October 20th. Where we would likely differ is over precisely how useful unions have been in the past; I suggest that much of the story of unions in the twentieth century has been one of tension between their administrative, representative and associative roles, with the administrative function ultimately winning out. Perhaps we would also differ on the usefulness of the mediatory function of unions, which I would suggest also exhibits a tendency to remain content in weakness, and often hobbles struggles before they begin. The other crisis to bring out here is the decline in party membership across all parliamentary factions: I suggest that this is a symptom of a generalised sense of disengagement from formal politics which rests on the assumption that those who govern us merely exist to further their own ends, and administer capitalism in largely similar variations. A generalised but justified cynicism, in other words. 2. I take Fisher’s use of ‘neo-anarchism’ to mean the array of political techniques and methods that emerged out of the anti-capitalist movement. These could be briefly characterised as involving ‘consensus’ decision-making, intermittent spectacular protests, an opposition to traditional models of organisation, and a frequent hostility or disregard for ‘theory’. If we were to impute an implicit theory of this kind of politics, it would probably involve a radical secessionism from the state, prefiguration of a new order of politics, and a disengagement from the economic in preference for the ethical. 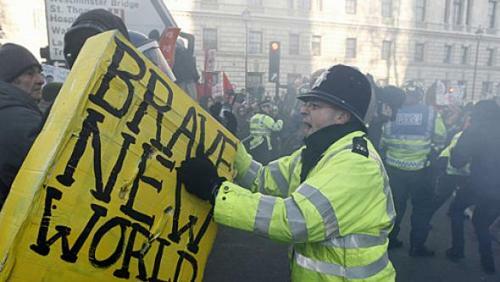 Graeber outlines some of the distinctive features of this movement in an NLR piece on ‘The New Anarchists’, from 2006. It is justified to say these movements did not achieve their external political goals, and introduced particular and intractable problems to the far left, primarily the glorification of marginality. Whether or not there is any value to ‘prefiguration’ as a political practice (and I don’t think it’s without merit), the witness of the last few decades would suggest it certainly isn’t sufficient. 3. As with all things prefaced with ‘neo-‘, this kind of folk anarchism is nonetheless deeply implicated in the history of the century that preceded it. Its roots are quite a lot deeper than its emergence into the spotlight in the 1990s, and it is worth trying to understand it not as a ‘left’ mirror of neoliberal work practices (I think Fisher has been reading Jodi Dean here, and there is some substance to it), but also as a reaction to the failures of both capitalism and the broad range of communist struggles against it that preceded its formulation. Equally, there is perhaps a problem in suggesting that left political practice always mirrors capital’s innovations, rather than the reverse. Can we not, too, innovate? The word ‘recuperation’ should be on our lips. Teasing out its precise genealogy is beyond my scope here, but I would suggest if its prominence in the extraparliamentary left is a symptom, its antidote is not a simple return to other, older models. 4. Fisher is right to see, in the Occupy movement as elsewhere, a kind of left secessionism that thinks a withdrawal from all of civil society is the first stage of a solution to the current problem. There are multiple ethical, semi-religious and political strands to this belief that can be examined, but the substantive political question that confronts it is always: secession from what and to where? But we might greet this with an equally stringent critique of ‘left nostalgia’ in practice: the use of the political forms of 1917 in a world unrecognisable to that era. It does not seem to me that the belief in the coming renaissance of the mass party in its classical form is any less a case of starry dreaming than the belief that we can secede from capital. 5. The two components of this critique that are most interesting to me are on the abandonment of the parliamentary terrain, and the ceding of mass media representation. On the former, I am more cynical than Fisher – though the question ‘if parliament is irrelevant, why do capitalists spend so much to influence it?’ is a good one. Maybe a fuller account of this wouldn’t involve an anxiety about the representation of labour in parliament, but the way in which capitalists compete against each others’ interests, intensified as the lack of new productive terrain means a race at the margins. Equally, some concentration on the pre- and post-political careers of those at Westminster yields some useful examples – Simon Stevens’s post-Blair career in private healthcare and his role in the destruction of the NHS, for instance. Was there ever a golden age in parliament? I’d answer no, of course, but there is a case to be made that the post-Thatcher ideological shift and the collapse of the Soviet Union has meant the sense of tangible possibility of a different mode has evaporated. That is to say, the sense of the contingency of capitalism on which opposition depends is less in evidence now than it was then, save when it emerges under the banner of generalised apocalypse: to end capital would be to end everything. Fisher makes this case very well. 6. It is on media hegemony that Fisher’s case is the most interesting, and the terrible consequence of left secessionism is the rise of projects devoted to the left talking to the left, rather than speaking to a broader audience. But after the struggles for airtime he references, what are we left with? And why is it that nothing politically intelligent ever graces our airwaves? I don’t think it’s just the left-secessionism I’ve been discussing here, but the removal of all kinds of serious contention over ideas from television. If we grant that there is a cynicism about politics, then there is also a cynicism about the integrity of the truncated and gestural ‘debates’ that we see on news programmes. The question to ask is surely whether there is a structural resistance to anything else among commissioning editors. The answer is, surely, yes. Fisher is a defender of Owen Jones against a lot of the cynicism and bile he receives from the far left, and there is something really worthwhile in that defence. Nonetheless, Jones’ socialism is of a kind that would have once been thought of as workaday, even relatively centrist – especially in its uncritical evaluation of employment and democracy – and it might be thought of as a sign of our poor times that he is thought of as a far-left firebrand. Some of this is positioning, doubtless – there are certain views that get you plain booted from the BBC – but what is the trade-off here? If we wanted to recapture media hegemony (and let’s argue more widely about exactly why this is a necessary thing), what kind of Faustian deal is necessary, and what price is acceptable to pay? And are there certain, less easily altered, forms of media presentation that would reduce us to the comedy communist in the corner? 7. There is a wider question about the composition of the class and its relation to capital that Fisher touches on by reference to the failures of the left to deal with post-Fordism properly. As elsewhere, I’d suggest we’re now really seeing the emergent crisis of a fragmented class presented with (a) a political system with no serious accountability to the people it governs, (b) a service-led economy where employers can only retain profits by increasing regimentation, regulation, work-discipline, wage-gutting and margin-boosting, (c) an ever-more-distant but also universally visible ruling class. This conjuncture ought to be political dynamite, but save a few flashes here and there, the powder’s not really been lit. In this, the attraction of ‘neo-anarchism’ becomes clear: it offers a promise of action against everything, as well as a freedom to act now. Despite its limitations, the allure of this political form should be understood. It’s worth mentioning the other anarchism which emerges out of the twentieth century, that of the Solidarity Federation, or Anarchist Federation, and myriad other anarchist-influenced projects, which try to deal with this head-on, without giving in to the mysticism of secession. In this respect, the new SolFed pamphlet is very much worth reading. Are we all Corbynistas now? I enjoyed the start of Mark Fisher's piece and have read his Capitalist Realism book but the last section of 'Not Failing Better but Fighting to Win" is bizarre. It seems as if he has a pretty basic knowledge of anarchism/'neo-anarchism'. "Part of the reason for that is the fact that they have taken place out on the street, ignoring the politics of the workplace and of the everyday. And that feels remote to ordinary working people, because at least with the unions, for all their flaws, there was a direct connection between everyday lives and politics. " Having briefly come across this website and anarchism as a student,during the protests and as part of my course, it was only when I started working full time or attempting to get full time work that I really, properly identified with the ideas. I would say it is the centrality of work to class struggle anarchism/libertarian communism that is its strength. The fact that it doesn't view the working class as just the fetishised industrial worker of yesteryear gives it relevancy in 2012 in a way that some left movements struggle to retain. I (might as well admit it now) work for an estate agent's (admin and junk mail delivery not 'an estate agent'...)some of the time and for a company that move sound systems at the weekend. I have similar conversations about work with my colleagues in both places as I do with my explicitly anarchist or communist friends - almost everyone hates work and the way that it controls our lives but I don't think any of my colleagues would run off to join A Communist Party. PS - I only realised this article was on the website of the CPGB halfway through my comment. If we wanted to recapture media hegemony (and let’s argue more widely about exactly why this is a necessary thing), what kind of Faustian deal is necessary, and what price is acceptable to pay? This is an interesting point, since, judging by his Twitter feed and what I've heard of Capitalist Realism (which is sitting under a pile of books I'm getting round to reading), he never seemed like a Leninist. The cynical side of me (and this is unsubstantiated, before I start a shitstorm) almost speculates whether he included the rather decontextualised call for a workers' party as a condition of writing for the CPGB (which would be odd, since it's not like the Weekly Worker has a broad readership/traction across the class, and those who do read it will hardly be sympathetic towards young anarcho tykes). Never got round to reading this book but I have listened to Fisher on an audio recording, read a few short articles by him and commentaries from other sympathetic left academics and accept that he makes some useful commentaries on the 'current state of affairs' facing us. James Butler's is the only slightly critical review I've found on this site and surely more could be said. I noticed the book got a favourable response from several anarchists on another thread with some justifications but this has only increased my suspicion of leftist trends in anarchism. Plan C are hosting a discussion in Manchester with Fisher and Morag Rose on the 22nd of this month so we will see how that goes. The Plan C meeting I mentioned above was genuinely interesting despite the discussion wandering a bit but I've noticed since then that the 'capitalist realism' and related 'lessons for the left' theme addressed by Fisher seems very popular just now as for instance witnessed in two UK Guardian articles - a 'selfie' by Elaine Glaser titled 'Bring Back Ideology' based on her book 'Get Real' and just today an article titled 'The Tories own the Future- the left is trapped in the past' by regular contributor John Harris. I'm sure there must be more along these lines in left leaning academic circles. Although the language is a bit different much of this chimes with analysis (if not the same political conclusions) common amongst the libertarian and ultra-left communist milieu as represented in the similarly themed ' demise of the social democratic era' and a critique of the traditional left nostalgia for programmes of re-nationalisation and state protection against the excesses of global capitalism. This superficial attraction to a surface similarity is however quite misleading it seems to me as what all these leftists are really after here is not encouraging a genuine social movement of opposition to capitalism perse but a search for a new accomodation with the reality of global capitalism to replace the now recognised outdated social democratic accomodation with the capitalism of an earlier erra. The previous 'accomodation' was the result of changes in the development of capitalism and in part the struggles of the working class and the real or perceived threat of that to capitalist interests which brought some benefits to the working class (many now under attack) whilst helping to stabilise and modernise capitalism. The brief and relapsed struggles against the initial effects of global austerity may have forwarned sections of the establishment that a second ideological defense, beyond that of the current arrogant and aggresive pursuite of a 'neo-liberal' agenda may be needed in the future. Are these recent attempts a rejuvinating 'the Left' part of that? Should we not see Fischer/Glaser/Harris and friends as just straightforward capitalist ideologists? In my post above I said '' I'm sure there must be more along these lines in left leaning academic circles'' and then referred to Plan C and the 'Accelerationist Manifesto' and indeed I was right as proof came in last night's Plan C three way 'conversation' between one of the authors of the above with themselves and the leader of the UK Green Party. An odd combination you might think given some otherwise very different perspectives (mostly not explored at this meeting), but all was revealed when it became clear that in terms of a 'way forward' from our common dislikes of work and 'leisure' as we experience it in capitalism and our common desire for a radically different way of life in the future, that this was to be the apparently shared commitment to promoting a demand of the state to provide a 'guaranteed basic or citizens income' for everyone. There was thankfully some questioning (but no actual critique) of this by a few people at the meeting but despite the denials of the three speakers that they regarded such a reform as some kind of 'silver or majic bullet' which would serve as a transforming agency towards a new and better world, that is exactly how it came accross.The political Left's (as opposed to the equivalent interest by the political Right's) rediscovered interest in this reform demand is perceived by them as some kind of practical bridgehead between the class struggle within capitalism and it's revolutionary overthrow and a way also of their making inroads into the political mainstream, but it seems more likely to be the 'Trojan horse' which the political mainstream are able to use to reign in support from it's radical fringes. As we have seen the way that more traditional Trotskyist 'transitional demands' have resulted in them ending up simply tailending mainstream Social Democracy so these slightly more 'libertarian' transitional reform proposals will most certainly have the same effect. I suspect that the (Social Democratic) Green Party may get more out of these 'conversations' than the radical Left. and other threads referenced there and particulary contributions from 'ocelot'. So I also listened to an audio recording of a WSM Dublin branch discussion of the 'Accelerationist Manifesto' available recently on their website at: http://www.wsm.ie The discussion part in the middle of the recording was a bit difficult to hear and follow but the sound quality of the critical introduction and conclusion is good and worth pursuing. This now available as a longer written review which despite some differences I have on the reviewers interpretation of the quotes from Marx still makes some good points. And since for my sins I attended a recent book launch by George Monbiot (along with wait for it 150+ others!) please add him to Paul Mason and the other list of media types referred to above. Monbiot often makes good points when he is dealing with ecological/green issues and emphasises the failure of both the Keynsian and 'Neo-liberal' projects to resolve the economic and ecological crisis of global capitalism, but then falls back on some land reform proposals and working through a still nationally framed, revitalised Bernie/Corbyn style social democratic left as the way forward. Like others much of his critique (which does include some valid observations) stays very much at the level of ideology and psychology and never really gets to grips with the real material basis of modern global capitalism, but then he's no Marxist! Whenever he gets a mention, I always remember an old article in the AF's Resistance bulletin which referred to him as "the ludicrously posh George Monbiot"
Some of this is positioning, doubtless – there are certain views that get you plain booted from the BBC – but what is the trade-off here? If we wanted to recapture media hegemony (and let’s argue more widely about exactly why this is a necessary thing), what kind of Faustian deal is necessary, and what price is acceptable to pay? And are there certain, less easily altered, forms of media presentation that would reduce us to the comedy communist in the corner? Well this was unfortunately prescient.